The New England Conservatory Summer Institute for Contemporary Performance Practice, also known to its participants as “Sick Puppy” was held at New England Conservatory in Boston June 15-23. An 8-day immersion into new and experimental music for advanced and professional musicians, SICPP began in the 1990’s when noted pianist and Artistic Director Stephen Drury began a contemporary music performance seminar for his students. 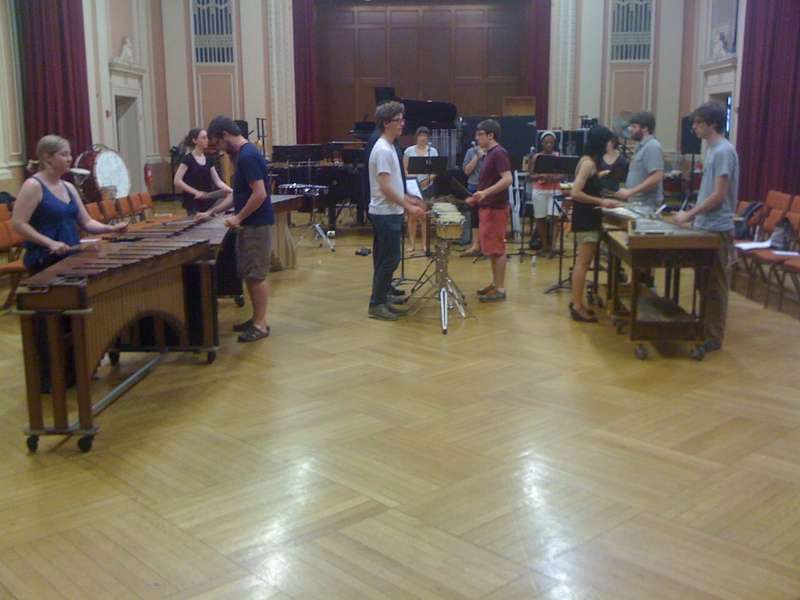 Eventually Drury began to add composers, percussionists, vocalists and instrumentalists until it reached its present form, a new music institute that includes an Ensemble Program, an Electronic Music Workshop, and the New Works Program, which is a workshop for composers who have the opportunity to study with the Composer-in-Residence. More than 50 fellows, including 10 percussionists, were selected to participate from leading conservatories and schools of music throughout the world. The percussion fellows were: Evan Bowen, Tyler Bragg, Sean Dowgray, Zachary Hale, Laura Jordan, Jeffrey Kolega, Cassandra McLellan, Christian Smith, David Tarantino, and Chia-Ying Wu. The experience was eight full days of master classes, lessons, colloquia, rehearsals and concerts, which presented the fellows with an opportunity to experience a large selection of new music that ranged from the music of John Cage through emerging composers. Each year the Institute invites guest composers and performance faculty that work directly with the fellows throughout the week. Past years have seen composers such as Michael Finnessy, Walter Zimmerman, Frederic Rzewki, Helmut Lachenmann, Tristan Murail, Jonathan Harvey, and Jo Kondo. Fellows rehearse and prepare works alongside faculty as well as with members of the Calithumpian Consort, a chamber ensemble in residence at SICPP. This year’s percussion faculty was comprised of Scott Deal together with Consort percussionists John Andress, Jeffrey Means and Nick Tolle. The Calithumpian Consort is a mixed ensemble comprised of professional musicians in the Boston area, directed by Stephen Drury. Their repertoire encompasses a large musical spectrum; from classic works of the last 50 years to works of the avante-garde, as well as experimental jazz and rock music. The 2012 SICPP highlighted the music of John Cage, a composer who was born one hundred years ago, and who, over the course of his career, profoundly changed our musical world. The featured composer in residence was Christian Wolff. Cage, Wolff, Morton Feldman and Earle Brown formed the compositional part of what is now known as the “New York School” in the 1950’s. One of the highlights of the week was an afternoon recital of percussion works performed by the fellows. The program included: Rebonds B, by Iannis Xenakis, performed by Evan Bowen; Family Portraits: Delbert great-grandfather, by Stuart Sanders Smith, performed by Tyler Bragg; Child of Tree, by John Cage, performed by Jeff Kolega; Locale Musik, by Walter Zimmermann, performed by Christian Smith; Psappha, by Iannis Xenakis, performed by David Tarantino; Time for Marimba by Minoru Miki, performed by Laura Jordan, and Density 21.5 by Edgar Varese, performed on handbells by Cassandra McClellan. Each evening contained a concert presented by the either the Calithumpian Consort or visiting guest artists, with an emphasis on the music of John Cage. Some of the highlights of the evening concerts included the world premiere of Overture and a performance of The Exception and the Rule, both by Christian Wolff and the world premiere of Braid, by Alvin Lucier, who attended the performance. Cage works figured most prominently throughout the evening concerts, and included Music of Changes for solo piano, performed by noted Cage specialist Joseph Kubera; Music for Seventeen performed by the Calithumpian Consort, Music for Piano, performed by Steffen Schleiermacher, and a simultaneous performance of 3 instrumental solos: 31’57.9864” For a Pianist, performed by Steffen Schleiermacher, 26’1.1499” for a String Player, performed by Karinna Fox, and 27’10.544” For A Percussionist, performed by Scott Deal. The main event for Sick Puppy occurs on the final Saturday with the presentation of a ten-hour series of concerts known as “The Iditarod”, named after the 1000-mile Alaskan Sled Dog race of the same name. This year’s Iditarod consisted of over 40 pieces. Works featuring percussion abounded, and included the full version of Drumming by Steve Reich, Merce by Christian Wolff (for percussion ensemble), Cartridge Music and She is Asleep by John Cage, Makrokosmos and Madrigals by George Crumb, Linea by Luciano Berio, Magnificat I by Linda Dusman, and Music for Children by John Zorn. SICPP is an invaluable and rewarding experience for anyone interested in new music and ready to tackle the challenges of 20th/21st century repertoire. Next year’s Institute will be held June 14-22 in Boston. You are currently reading SICPP 2012 Summer Institute at Scott Deal.